"This is a quick and easy throw-together salad that is super tangy and creamy and a way to use up some of your fresh garden veggies. Very refreshing! Increase or decrease amount of vinegar and mayonnaise to your liking." 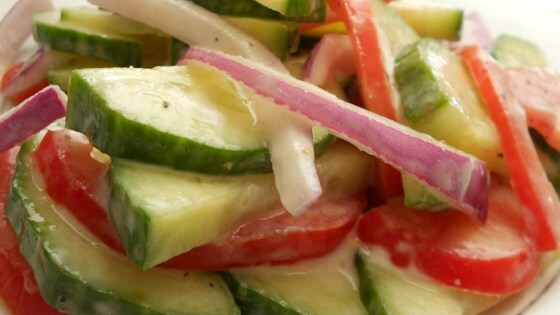 In a medium bowl, toss together the cucumbers, red onion and tomato. Gently stir in the mayonnaise, vinegar, salt and pepper until coated. Cover and refrigerate for at least 1 hour before serving. If you’re good at smashing, you can make Chef John's great salad! I was a little disappointed with this recipe. It was bland, and after refrigerating for a few hours the dressing became quite runny. This was a delicious recipe! I used my food processer to slice everything, I used 1/2 mayo, 1/2 sour cream and added fresh dill. My husband and son had seconds, which says it all! This was so delicious i was practically drinking the leftover dressing from the bowl! Only made one change, 1TBS mayo and 1TBS sour cream.